We’ve been caravanners for… around nine years now, I think? Ten, maybe? We’ve done lots of short/medium trips, from a quick weekend to a journey of around 10 weeks when we made our way up to Airlie Beach for the wedding of our youngest son Paddy and his long-time other half, Tash. That was in… (hang on while I check my Facebook timeline!…) in 2009. In January 2012 we bought a new tow vehicle, a Mazda BT50, and in March we took our Northstar Windeyer van in to have some modifications done – adjust the table height for recliners; install a full shelf over a benchtop; reposition the TV arm and install a washing machine. All of which has, of course, been recorded on the blog! Now we have sold the too-big family home and settled into our new home. We have also settled into our new routine – which is pretty loose, really: home for part of the year and on the road the rest of the time! Our trips will be anything from a weekend away to three months – and as of September 2013 Marg has taken on a new role: Editor of Caravan & Motorhome on Tour. Fits perfectly with our travelling lifestyle! Reading with interest about recent purchase of your BT50. Thinking of purchasing one in the near future to do some caravanning/travelling with our young family. How do you think a family of four would travel for long distances in such a car? I have test driven one and was impressed by the power/grunt. I liked the package with the not too excessive price tag – compared to a prado/land cruiser. We liked the same things about the BT-50: the power and the price tag! We also liked the quiet ride when we went for a test drive. Our feeling is that the car would perform well. The back seat might still not be as smooth a ride as a Prado or Cruiser, since the BT-50 has leaf springs, but it should be plenty roomy enough. Wow I just found your website, how exciting! We really enjoyed your travels around Australia for C&M, we look forward to reading about your upcoming adventures on your website. We can’t tell you how much we’re dying to hit the road again! We’re planning to put up caravan park reviews ans chat about attractions as we go… So stay tuned; you should find a bit posted in the next few weeks. We are at Seaham Port Stephens. We currently have a 17ft Jayco Destiny our tow vehicle is a Mercedes Sprinter that we carry all our toys in (e.g. kayaks, mountain bikes, snorkelling gear and our motorbike) we are heading off in May and heading for Lightning Ridge maybe we will find that Opal that will pay for the trip and more. Looking forward to reading your posts. Do you know if there is anywhere that I could get the C&M copies of your vol 1&2 Rob & Marg Around Austraia? The publisher has no back orders available. I borrowed vol 1, and was so impressed with the information, I’d love my own copies. Sorry, Jan, if it’s not available through the publisher then I don’t know where you can get copies. How about sending a letter to the editor of C & M asking if anyone has back copies they could send or sell to you? Sorry for the delay in responding to this… we’re packing up to move house, and things are a bit chaotic! I just read that you have sold up moved from the Illawarra. Ok, What part of the South Coast have you moved too, I am assuming it is the South Coast. I like south of Berry down to Eden, any where in between. We’re still on the South Coast – we moved to the next suburb! Just renting. We haven’t decided where to buy again, so we’re renting while we think it over. Berry’s lovely, but I think I’d like to stay near the coast. But we have a lot of travelling to do first! Thank you Rob for all the information you gave my husband John and I on caravans. We have been looking endlessly at so many different vans over the last twelve months or so, Our Dmax is still Johns pride and joy we have had it around 14 months now and it just purrs like a kitten, very happy with it. We are about to order the inspiration from crusader , can you please tell me if we should order it with a satellite dish or should we just have it pre wired for one and buy it elsewhere. Other people have told us its cheaper to have things like solar and satellite dishes installed later as the manufactures load the price ( like everything else ) any way any more tips would be great , And yes it does have a washing machine, I’m with Marg on that one!!! It’s simply easier and more convenient to get everything installed when the van is being built. Also, if it’s done during construction the warranty is all based at Crusader (well, I guess you still might have to take it up with the manufacturer of the item, but it was all installed at the same time.) We never really bothered getting separate quotes for everything installed as an after-market option, because it was just easier to do it all at once! Case in point: we said ‘no’ to a Winegard TV antenna during construction, because we were not greatly impressed by Winegard with a previous van, thinking that we’d install something else later – we were looking at Saturn aerials, I think. Then Winegard brought out an attachment that made things better, and we never did get around to having a rooftop TV aerial installed – and the old stick aerial was a pain! As it happens, our van is on its way back to Victoria for some warranty work because of some water damage, and we’ve asked them to install a rooftop TV aerial at the same time. Should have done it the first time! LOL. One issue with the sat dish installation on the roof, is that you are restricted with the reception at times. e.g – if you don’t have direct line of sight to the satellite, the fixed roof dish won’t work. A portable sat dish can over come that problem by being able to be moved around manually on the ground until a signal is located. As you know, we also had a washing machine installed later – and I’m sure that ended up being more expensive that just having it included in the build. If you want to save money, by all means shop around – but for us, the easy way is better. We have been catching up with your life since we first met you guys at Sth Mission Beach, just after your mishap with the truck! It was our 1st trip ever towing our Regent van with the Pajero and we have never regretted it, we just LOVE it. That trip went for 5 months in 2010. Next year we had 4 months doing the SA peninsulas and the Flinders Ranges, even treating ourselves to flying over Lake Eyre. First time in a 4 seater plane!! Then last year we had 6 months travelling from home [vic] across the Nullarbor, Kalgoorlie back down to Esperance and then along the coast to Perth and up to Kunanurra and over to Darwin, Kakadu and back home through the centre. What a trip, Thoroughly had a ball. This year its a little different with our two boys both building new homes so we want to be home to help them move. So we are off 1st week in March to go to Mallacoota then up to Cooma, Canberra, Goulburn, Orange etc. We only have 2 months away!!! Are you going anywhere near these places this year? We would love to catch up with you two again if possible. In fact, when we read your comment, Rob said “…and that was where Rob got some great hooks (they used to be used for tie-downs on cranes at Port Kembla) from one of our party… we’ve just spent ten minutes trying to remember his name, but it escapes us! (He came from Dapto.) Can you remember??? His wife was one of the Margs. Of course, since she wasn’t you! Anyway, we took a photo of Rob pointing at the hooks, and we’ll put them in the next post. Sounds like you’ve had some great trips since Mission Beach. We really liked the Eyre Peninsula. We loved South-East WA, too: that’s a definite go-back-to. Surely we can catch up in your 2 months away while we’re away in March – I’ll post our proposed trip route on the blog and we’ll see if we can catch up somewhere. That’d be fantastic! Yes his name is David[ Dave]and yes they were from Dapto. We have their email address if you want it. Look forward to perhaps meeting up again on our and your trip away very soon. Will look on your blog to see where you are going. Sorry this is short and sweet but the family are here now so I will have to get dinner started. Nice to touch base with you! We chose a BT-50 because of the towing capacity. Our van (our own van, which is a Northstar Windeyer) is quite large and heavy, and we wanted a good safety margin. The D-Max could tow 3 tonne, whereas the BT-50 was 3.5. No contest! Since there are usually only the two of us in it, we didn’t care about rear power windows – didn’t even enter our heads to look into that. But I have a feeling that our windows are powered back and front. Rob’s out in the car at the moment, but I’ll check when he gets back. How are you finding the BT50 now you have had it for about 12 months. We have the GT model and are currently travelling from Melbourne to at least Bundaberg for winter and are towing a 2800kg Evernew. Instead of doing about 90kph, we are finding it wants to sit at about 100-110 kph so we have been letting it have it’s own way[without speeding] and the trip computer is sitting on 15.9litres/100ks since leaving home. Have also found I don’t need to use the sway control like we had to when using the Prado. The Crusader van was 22 ft INTERNAL, which meant that it was actually quite a long van – from towball to spare tyre it was around 30 ft overall. We found it was pretty good in most places, but some of the older parks have smaller sites and it can be tricky backing in. If you’re towing behind a Navara d40, you need to keep in mind the overall weight of the van – compare apples with apples; 22ft vans can vary quite a lot in weight, depending on the construction and brand. e.g. European 22 ft vans can be much lighter than Australian 22 ft vans. The combination of the Isuzu DMax and our Crusader van was probably not ideal – we were on our limits pretty well all through the trip. We have now chosen a better balance between tow vehicle and van. Feel free to ask more specific questions if you like; if we can help we’ll be more than happy to do so! Hey Marg, Not sure if this is the right place to ask questions? We have a 2003 Roma 19’6 towed by 2005 Hilux petrol. We are currently looking at the Madaz BT50 or the Isuzu D Max,(diesel). Know you and Rob have had both of these vechiles which one does Rob thinks is the best and why. Would love to read his thoughts. I’m typing this as Rob dictates (since I had the laptop over here…). OK. That’s a toughie, because there are cost factors involved. My preference (funds being no object) is for the BT50. It has a higher towing capacity, which translates to a higher safety margin even if you don’t need it. We do find it to be a more comfortable ride; there’s more internal space (for both driver and passengers – we lent it to our son when they travelled with their three kids to Queensland – a lot more space in the back seat.) Note: this extra space does translate to a longer vehicle (Marg here: It only just fits in marked parking spaces!) On the other hand, if you’d rather keep a bit of cash spare for other things, you can probably get out of the DMax more cheaply – and it is a good vehicle. A friend of mine has a current DMax and he has reported no issues with it; he tows a van similar to yours. Either vehicle is a good bet – in the end boils down to cost and personal preferences. Back to Marg: That probably still leaves you scratching your heads! However, we’ve come into contact with quite a few BT50 owners on our travels now, and everyone we’ve met is happy with their choice. Carmel and Dennis told me recently that they met you both in Bollon. I was pleased to hear you are still ‘on the road’ and enjoying yourselves. It is a great life, isn’t it? Graham, my husband ( who is Carmel’s brother) and I have converted an old Leyland school bus into an RV and we are doing a tour around Australia. We haven’t been that far so far as we were having a little mechanical trouble with the bus but now seem to have ironed out the problems. Fingers crossed! We have travelled from Brisbane to Hervey Bay, down to Darlington Beach Resort, Grafton, Illuka, Ballina, Deception Bay ( for repairs!) Burrum Heads, and on to Gracemere, near Rockhampton. Every moment has been an absolute ball! I give a commentary of our trips and include some photos. I find it a good way to let my family and friends know where we are. Lovely to hear from you! Your trip sounds fantastic (mechanical troubles excepted!) and I’m sure you’ll continue having a fantastic time. Maybe we’ll meet up on the road too one day! Yes, we love the life. Checked out your website and the Big Yellow Mongrel Bus… and surprise! It’s a big WHITE mongrel bus now, with some swish spray painting on the side! Love it. Loved following your travels on your big trip around Australia. Really happy to have found your new blog, to once again follow your travels. On your travels did you ever tow a van between Corryong & Jindabyne, we hear it’s a tough trip up from Corryong. 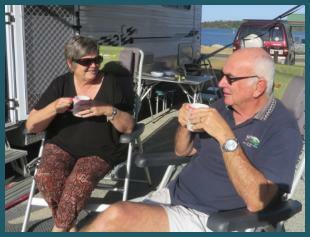 Thanks Marg, we’ve decided to leave our van at Corryong and get a cabin in Jindabyne for a couple of days to explore. Loved following your around Australia adventures,happy travelling, hopefully we might meet some were around this great country in the future. Thanks for your many articles and insights. Keep them coming. We were recently was going back over some old mags collecting bits and pieces of info when we noticed a photo of Rob tending his new firebox whilst camping outside of Lightning Ridge. The firebox appealed to me as a handy requirement for camping. The article was written some time ago and was called “Join the Free Happy Campers” and must have been when you were on tour around Australia. I was wondering if you could advise if the box was commercially available and if so where it might be available. Send us a pic of the results, so we can put it on the blog!